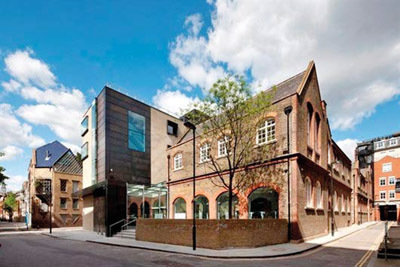 The Royal Institute of British Architects (RIBA) has named the Goldsmiths’ Centre, Clerkenwell as one of the best designed workplaces in the East London Region as part of its 2013 awards, just over a year after the Centre opened to the public. The state-of-the-art building is the result of a close collaboration between architects Lyall, Bills and Young and the Goldsmiths’ Centre – the leading charity for the professional training of goldsmiths. The project started in August 2005 when the Goldsmiths’ Company began to explore the idea of setting up a charitable training centre which would help new and aspiring goldsmiths and jewellers succeed in their careers in the industry, whilst promoting the goldsmiths’ craft to the wider community, for the benefit of public and trade alike. A stunning glass atrium links the traditional Board School building with modern workshops, studios and events space, making use of the original covered playground area and creating a sense of light and space. Externally, the use of hand-patinated brass panels against the York stone references the activities that go on in the building; whilst inside, the use of stone and oak clearly expresses the ambition that the building is to last a long time and age well. This design approach reflects the ethos and intentions of the Goldsmiths’ Centre charity, which has been set up to sustain the time-honoured craft of goldsmithing for today’s world and equip young people with the skills to set up in business or enter employment, learnt at the bench with skilled craftspeople whose workshop rental funds the Centre’s activities.